With a Team of nearly 100 dedicated and highly skilled technicians and staff, Cundiff Heating and Air Conditioning serves Customers throughout twelve counties of Virginia’s Southwest and Southside. From his headquarters in Roanoke, VA, company founder and owner Jerry Cundiff directs his people with a hands-on, results driven approach to customer service and satisfaction. He makes his business philosophy abundantly clear; every employee of Cundiff works solely for the customer. It is a simple and undeniably successful concept for all. To learn more about the services offered by Cundiff, click the tabs below. If someone in your home suffers from allergies or asthma, then you know the importance of indoor air quality. It is important to understand how your air ducts can get clogged, why you should clean your air ducts, and what is involved in the air duct cleaning process. How Do Ducts Get Backed Up? Air ducts can accumulate dirt and debris over time. Dust accumulates in the home and gets pulled into the system, even if you change the filter as often as recommended. The same kinds of dust bunnies that accumulate under furniture can form in the ducts that supply air to bedrooms and other parts of the house. Threats from clogged air ducts include mold, vermin, dust, and debris particles. Mold can cause those with allergies to have problems breathing and, in extreme cases, even affect the respiratory health of others. Taking control of the indoor air quality in your home is an important step towards protecting the health of your family. Insulation around air ducts that is allowed to get wet may collect mold, and it should be replaced. You should be aware that although a substance may look like mold, a positive determination of whether it is mold or not can be made only by an expert and may require laboratory analysis for final confirmation. For about $50, some microbiology laboratories can tell you whether a sample sent to them on a clear strip of sticky household tape is mold or simply a substance that resembles it. Our professional duct cleaning service involves more than just sweeping the air ducts. Cundiff Heating and Air will examine and clean all components of the HVAC system including the unit, blower, and vent covers to ensure proper air flow through your system, improving the efficiency of your system and freeing you from potential hazards. 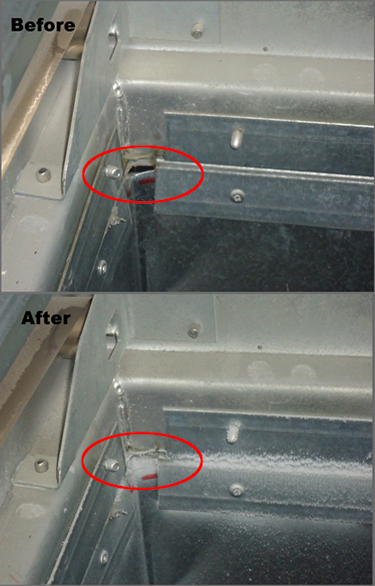 To maximize the efficiency of your ductwork and keep things clean, we also offer Aeroseal leak protection. 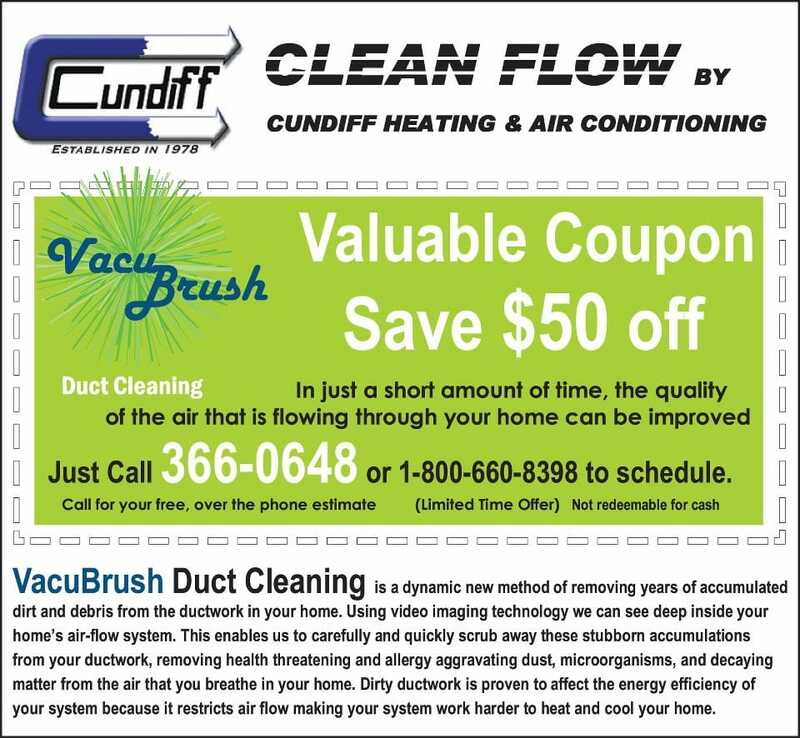 Contact Cundiff Heating and Air today for more information or to schedule a service appointment. Aeroseal was first developed in 1994 at the Lawrence Berkeley National Laboratory through funding from the EPA (Environmental Protection Agency) and the US Department of Energy. Aeroseal has proven to be the most effective, affordable, and viable method of sealing leaky ductwork systems in residential homes and commercial buildings. Currently, more than 85,000 homes and 500 commercial buildings throughout the US have been treated successfully. Duct sealing can help you save on your monthly heating and cooling bills, resulting in more money in your pocket. Leaky duct systems typically contribute to 20%-40% of a home’s heating and cooling costs. Energy efficient homes using duct sealing can increase a heating and/or cooling system’s efficiency to a greater degree than upgrading to a high-efficiency furnace and with less of an investment. Additionally, if you plan to install a new heating and cooling system, having efficient ducts may make it possible for you to downsize to a smaller, less costly system. If you find that some rooms in your home get too warm while others stay too cool, or if you experience uncomfortable drafts, it might be due to leaks in your duct system. Sealing ducts can help keep the temperature even. Sealing your ducts can also improve the air quality inside your home and safeguard the health of your family. Leaky ducts can cause the air in your home to carry pollutants like car exhaust, pesticides, insulation fibers, mold or mildew, and more. Duct leaks can also draw in combustion gases from fireplaces, wood stoves, gas and oil furnaces, and water heaters. When you seal the ducts in your home, it reduces the amount of energy your home uses. The less energy we use, the less pollution we create. If we all do our part to conserve energy, we will have a cleaner, healthier environment. How Does Aeroseal It Work? Think of it as a “Fix-a-Flat”” for your heating and cooling system. By first sealing all vents and registers in your home and then putting the escaping air under pressure, Aeroseal’s computerized system and software enables us to accurately measure duct leakage. Then using the proprietary Aeroseal injection process, polymer particles flow through the airstream, find all the leaks, collect upon the edges of each establishing a point to which subsequent circulating particles will adhere to ultimately close each leak. This system of “search and seal” works throughout the ductwork of your home. Since it works form the inside of your ductwork, it easily fixes all leaks, even those hidden behind walls and under insulation. The entire process usually takes just a few hours and the results are immediate. Aeroseal was selected as Popular Science’s “Invention of the Year” in 1996 and was recently named to the U. S. Department of Energy’s “Top 100 Inventions of the last 23 years” and was recipient in 2011 of the This Old House “Best New Product Award”.